Training: Mon and Wed night. 7pm-9pm. No training on Bank Holidays. There is a charge of €2 per night for training. You need to be a fully paid up member to attend training. C.I.T Track is also used for training. Membership Update: Any new members (excluding Fit4Life) wishing to join please fill in this online form. Next committee meeting: 9th April at 8:30pm in Munster Arms. Annual club summer camp will be held 1st – 4th July. Application form is below and completed forms can be returned at training to book a place. Next big event is the 1st leg of the West Cork Track and Field Championships which is on Sun 7th with an 11am start. 2nd leg is on the following Sat 13th with a a 12noon start. This year there is a team aspect to the Senior Mens and Womens 3k race, so hoping a number of road runners might decide to give the track a go for a change. 3km race will be the 1st event on the Sun, so will have an 11am start. No need to pre-enter, just turn up on the day. Also, this year the existing trophy for Best Overall Club is being replaced by the Catherine Duggan Memorial Cup. Bandon AC have won the Best Overall Club at these championships for the last number of years, so we really want to be the first name on this new award, so expect a big turnout of club members on both days in an effort to bring this trophy back home to Bandon! 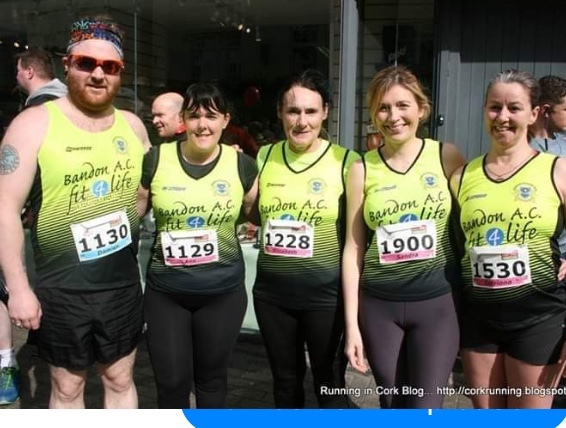 Bandon Fit4Life group is indeed strengthening up and preparing for the Cork Marathon. Beginner and intermediate groups will be taking part in the relay section of the Cork Marathon. Several members will also compete in the Dublin City Marathon later in the year. 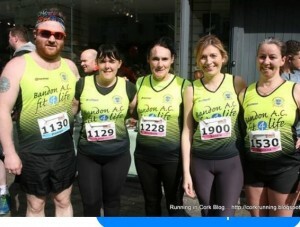 Bandon is well represented by Fit4Life who compete in different events every weekend. No doubt that there Are great things in the horizon for them in the future. Well done to Juvenile members who took part in the recent West Cork road races in Dunmanway last weekend. Some great performances and close finishes! Medalists were- girls Under 9 Jennifer Bamford bronze; Under 9 Boys Patrick Feeney silver. Girls under 11 Maeve Dollard bronze. Boys under 13 Adam Sexton silver, Daniel Dollard bronze. Thank you to all the coaches and Juvenile members who took part in the St. Patrick’s Day parade in Bandon. Huge thanks to Gerard Healy for the use of his bus on the day. Thanks also to the Committee members and coaches for organising it. Next big day out is the West Cork Track and Field Championship on 7th and 13 th April next in C.I.T..
Droumleena Lawn (Show grounds) Dunmanway, 12 noon. All athletes have to be registered with clubs in West Cork Division. Singlets or club t-shirts with club name and colour is required. Cost to compete: €2, Pay on the day, no need to pre register. The races will start and finish near the entrance to Droumleena Lawn which can be used for parking. Our annual awards/social night is on next Saturday 9th March at 8.00 pm in Bandon G.A.A. Pavilion. As well as overall awards for track and field/cross country, each coach will present individual awards to athletes that he/she mentors. It’s always a great night, we would ask that all members and their families attend. Music and refreshments will be provided. Program for West Cork Track and Field has been decided. It’s over two days; Sunday 7 th April @ 11.00 and Saturday 13 th April at 12.00. We would encourage all members to come and compete and gain experience in CIT. Congratulations to Phil Healy for placing third in her 400m semi final in Glasgow last weekend. Unfortunately due to been clipped in a collision she did not progress to final. Carmel Crowley – Masters athlete recently received an award for her International achievements in Cross Country for 2018. Other recipients of ‘Aspiring Young Athletes Awards’ were Gavin Kenny, Diarmuid O’Connor, Lauren McCourt, Niamh Sugrue, Tristan Chambers and Fionn Harrington. Congratulations to you all. Bandon Fit4Life is going from strength to strength. Beginners are now at three miles. The marathon training is underway, currently reaching ten miles. Aiming for the Cork to Carrigaline (15.5 miles) run in six weeks time. Linda Hodnetts group are training for Dublin marathon. The advanced group are preparing for Cork City half/full marathon. They are currently running thirteen miles at training. Keep up the good work. Recent Juvenile medallists at the Munster Indoors are; Lewis Lenihan Under 13 , was third in shot putt. Molly O’Donovan Under 13, was second in shot putt. Eoin O’Callaghan Under 13, was first in walk and second in shot putt. Congratulations to all who competed and attained their personal bests in this season. National Indoor Championships last weekend. Phil Healy received Gold in the 400m race, attaining a time of 52.81 seconds in the Final. Phil has also been selected to be on the Irish team that will compete in the European indoor championships in Glasgow, this March. Shane Howard also placed first for Gold in the senior mens long jump, with an enviable jump of 7.44. Joe Gibson and Fiona Everard performed well also, finishing outside the medals. To come away with two Gold medals is excellent, and we would like to congratulate all four senior athletes and their respective coaches. The results of the Munster Schools Cross Country , held In W.IT. show that some of our members have progressed to the All Ireland schools finals next month. Wishing them all the best in their endeavors. On another celebratory note, we would like to wish Mr. Michael O’Reilly- Long time member and loyal supporter of Bandon Athletic Club a very happy 90th Birthday. Recent results from Munster Senior,Junior and Masters Indoor Championship in Nenagh. Senior Women; Roisin Howard placed second in 60m hurdles, Shot Putt and weight for distance. Roisin won bronze in high jump and triple jump. Five medals in total. Congratulations. Junior ; Erin de Burca placed sixth in 60m and seventh in 200m. Olivia Tuthill competed in the 400m and placed fifth. Masters; Liz McCarthy Coomey (W45) had a fantastic day at the indoors. Liz won Gold in four events; namely 60m hurdles, high jump, weight for distance and long jump. Cosmos de Burca came away with two silver medals for shot putt and weight for distance. Cosmos placed sixth in 60m. Excellent performances from these Bandon AC Members. Last weekend, Phil Healy placed second in the Cheryl Toussaint Women’s 400m in a time of 53.72 seconds at the Millrose Games in America. Congratulations Phil. Amazing news from Vienna, from the International Indoor Meet, where Phil Healy won the 400m race in 52.31 seconds. This is the fastest time in the Europeans and the World Championships. Next on Phil’s agenda is the European Indoor Athletics Championship which is taking place in Glasgow in early March. Congratulations to Phil and her Coach from all at Club. Shane Howard won the Senior Long Jump at the AAI games held in Dublin last weekend. Congratulations! Bandon AC were recently presented with an award for being the best Juvenile B Cross Country Club in Munster. Congratulations to all the athletes and coaches involved. At the All Ireland under 23 Indoor Championships in Athlone, on January 27 th last, Joe Gibson received bronze in the 60m sprint, Fiona Everard also won bronze in the 1500m race. Excellent start to the year for them both. Following on from this, Fiona placed sixth in the 3000m race last Saturday in the AAI Championship held in Dublin. Laura Nicholson also competed and placed third. Finally, Grace Nyhan placed tenth in her race at the All Ireland B cross country which took place in Dundalk last weekend. Congratulations to Phil Healy, Bandon AC member, Ireland’s Fastest Woman! Phil was the overall winner of the 2018 West Cork Sportstar of the Year at the 21 st Annual Awards ceremony in the Celtic Ross Hotel, in association with C103fm and The Southern Star. An excellent night was had by all. Diarmuid O’Connor and his Coach Frank Stan have to be commended on achieving a new championship best at the Irish Life National Combined Events , which were held in Athlone last weekend. Our girls under 18 Relay team placed third in the Munster Indoors Championship held in Nenagh last weekend also. Congratulations and well done to those that competed and placed. Best of luck to our members who will be representing their respective Secondary schools in the West Cork Schools Cross Country In Dunmanway. Up for grabs is the EBS Perpetual Shield for the best boys / girls school.